Some bodybuilders achieve muscle growth by bulking -- increasing weight and presumably -- muscle by overeating. They then "cut" when going into the competition season by prioritizing fat loss and maintaining any muscle the bulking helped them build. These athletes eat for calories -- not necessarily nutrition -- and ice cream is often included because of its calorie density. While a muscle-building phase in a bodybuilder's cycling is important, ideally, it includes mostly whole foods rather than foods high in sugar and saturated fats. Ice cream may be an occasional treat that adds calories, but generally opt for healthier more foods often to add extra calories and protein. Gaining muscle requires a surplus of calories. You can't build tissue without adequate fuel. Bodybuilders sometimes take this advice to the extreme and add thousands of calories, along with heavy workouts, to build mass. In reality, your body can only build -- at most -- 1/2 pound of muscle per week. To gain a half-pound weekly, you should add about 250 calories to the number you need to maintain your weight, and follow a strength-training routine targeted for muscle gain. Some people are "hard gainers" with a high metabolism and may need as many as 500 calories more per day to encourage muscle gain. Eating 1,000 or more additional calories per day, the equivalent number of calories in 2 cups of premium ice cream, only encourages an increase in body fat. If you gain more than 3 pounds per month, it's likely that some of that is fat -- not valuable muscle. Too much fat makes it that much harder to "cut" for competition and puts you at greater risk for certain chronic conditions, including heart disease. An occasional 1/2- to 1-cup serving of ice cream could be used to boost calorie intake, but it's an exception, not the norm. To boost muscle growth, it's best to add calories by increasing the amount of protein you eat. 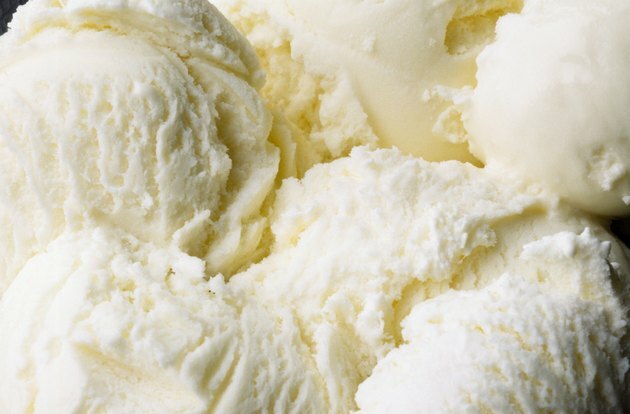 Protein is a better fuel for muscle synthesis -- the process that yields muscle growth -- than fat is, which makes up the bulk of the calories in ice cream. Aim for between 0.6 and 0.7 grams of protein per day to boost muscle growth. This means for a 180-pound person, you'd want 108 to 126 grams of protein per day. A 1/2 cup serving of ice cream offers 266 calories with about 3.7 grams of protein and 17 grams of fat, 11 grams of which are saturated. You'll get more nutrients and less sugar if you increase your calorie intake by adding a cup of shredded, roasted chicken meat. You'll get 35 grams of protein in 244 calories, with 9 grams of fat, only 3 of which are saturated. A cup of low-fat cottage cheese offers 183 calories, with 24 grams of protein and 5 grams of fat, with only 3 of those grams saturated fat. Two eggs provide almost 160 calories with 10 grams of fat -- 3 grams of which are saturated -- and more than 12 grams of protein. Even a cup of cooked, long-grain, brown rice has 5 grams of protein in 214 calories; the rice doesn't contain all the amino acids you need for optimal muscle synthesis, however. Mix this with 1/2 to 1 cup of black beans to get the additional amino acids to make it complete. If you're craving a frozen treat, try making your own frozen fruit pops from Greek yogurt and pureed fruit as a higher protein alternative to ice cream. A 3-ounce portion of Greek yogurt contains 9 grams of protein. Even if you want to add fat to boost your calorie intake, you're better off getting it from healthy, and mostly unsaturated sources such as olive oil or avocado. For example, a cup of pureed avocado contains 384 calories and 45 grams of fat, with only 5 of the 45 grams being saturated fat. Some bodybuilders force-feed themselves certain foods, such as ice cream, to gain a lot of weight fast, but much of this is fat weight. They then have to drastically reduce calories and must exercise extraordinarily hard to lose the extra fat. The process by which you lose fat -- creating a calorie deficit -- is not conducive to muscle growth. You may actually lose muscle during this process, which is contrary to a bodybuilder's goals. Eat 1/2 to 1 cup of ice cream as an occasional treat when adding calories to build muscle, but don't go much over the daily 250- to 500-calorie surplus goal, or you'll likely put on a lot of fat that you'll need to drop once competition season approaches. If you want to add fat to boost your calorie intake, you're better off getting it from healthy, mostly unsaturated sources such as olive oil or avocado. For example, a cup of pureed avocado contains 384 calories and 45 grams of fat, but only 5 grams of the 45 are saturated. Bulking without strength training will cause you to gain mostly fat, and almost no muscle. A program that addresses every major muscle group, usually with compound exercises, such as squats, dead lifts, presses and pulls, is required for major muscle growth. Use weights that feel heavy, in four to eight repetitions and do as many as three to six total sets. Multiple exercises for each muscle group -- even those that are challenging for you -- may be required for the results you desire. A pre- and post-workout meal may help boost your results. Ice cream pre-lift isn't advisable, but you could include it as a way to boost calories and improve the taste of a post-exercise shake. Blend a 1/2-cup size scoop of ice cream with low-fat milk, berries and protein powder to have within 30 minutes of your session. Account for this extra 266 calories when computing your total intake for the day.